one of my foodie friends, sheri, emailed + asked if i had a good red velvet cake recipe. i had actually never made a red velvet cake before + figured this was a good excuse to try! i looked through a bunch of recipes + settled on bobby flay’s version. for the frosting, i decided to use the same cream cheese frosting (from martha stewart) that i used in my pumpkin whoopie pies, as everyone raved so much about it. if you’ve never tried red velvet cake, its flavor is basically a mild chocolate one, so the color + the frosting is where it really shines. people have different opinions on the color, + it can vary anywhere from bright red to red-brown. for me, the bright red color isn’t as appealing, so i made mine reddish-brown. you can definitely punch it up + make it redder by adding more food coloring. the verdict? six of us sampled this cake a few nights ago + everyone was very pleased with the flavors of both the cake + the frosting. i will say that this makes *a lot* of fairly rich cake – you could probably serve over a dozen people with this recipe. if you’re looking for another great dessert idea, this would make a wonderfully festive addition to your holiday meals! preheat the oven to 350 degrees. butter + flour two (9-inch) cake pans + line each pan with a round of parchment paper. cream the butter, sugar and oil in a stand mixer fitted with the paddle attachment until light + fluffy. add the eggs, one at a time, scraping down the sides of the bowl + beat until incorporated. beat in the vanilla, vinegar + food coloring. add the flour mixture to the batter in 3 batches alternating with the buttermilk, mixing well after each addition. divide the batter evenly between the prepared pans + bake for 30 to 40 minutes or until a wooden skewer inserted into the center comes out with a few moist crumbs. cool on a baking rack for 15 minutes before removing the cake from the pans. let cool completely before frosting. slice each cake into 2 layers + frost. which recipe do you use? since this is the first one i’ve ever made, i’d love to try a few different recipes for comparison if you have one to share! =) i’m also thinking of converting the recipe into whoopie pies, since those are so easy to put together + such a crowd pleaser. yes! i just think whoopie pies are so much easier to bake + frost than a 4 layer cake! plus, if it’s for a party, then you don’t have to worry about slicing it – everyone can just grab one + go! 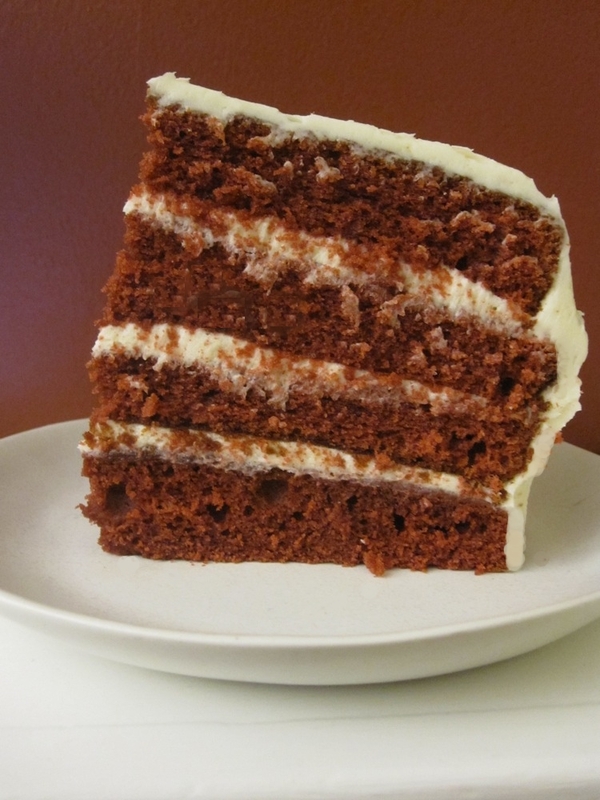 Red velvet is my BILs favorite cake…I’ve promised to make him one for his b’day for years, but never have. Maybe this year!! Come by my blog when you get a chance…having another giveaway, and think you’d love it!! you would be the best sister-in-law in the world if you made him a fancy red velvet cake. like i said to some of the previous commenters, i think these would convert wonderfully to red velvet whoopie pies or even cupcakes – i’d just adjust down the amount of frosting (+ the cooking time) because you wouldn’t need quite as much. =) i’ll pop over to your blog now – this just might be my lucky giveaway win! the frosting analysis was spot-on–half of the amount used for the four-layer cake is perfect. just like the pumpkin whoopie pies, they took 15 minutes to bake in the oven, then just a few minutes to cool before assembly. this is so fabulous, julie! i can’t wait to hear how they go over at your holiday cookie swap. i’m glad you confirmed the amount of frosting needed. i guessed about half would do it, + it’s good to know that’s spot on. have an awesome time at your party + eat some cookies for me! Next post: christmas brunch menu + a call for ideas!